Core muscle strengthening has gained huge popularity amongst physiotherapists, personal trainers, exercise physiologists and other professionals interested in exercise prescription. In particular, core muscle strengthening is used extensively for rehabilitation of low back pain. Real time ultrasound is now being used to improve the process of core muscle rehabilitation for lower back pain and Active Lifestyle Physiotherapy has started using real time ultrasound in their practice for this purpose. The core muscles are made up of the abdominals (transverse abdominis) at the front, the paraspinal muscles at the back (multifidus), the diaphragm as the roof and the pelvic floor and hip girdle muscles as the bottom. As a unit these muscles work as a corset that supports and braces the body and the spine. Research has shown that in normal healthy subjects, the transverse abdominis muscles activate just prior to limb movements to protect the spine. In patients with low back pain the activation of transverse abdominis is significantly delayed during limb movements. Furthermore, although most non-specific low back pain settles spontaneously, recovery of core muscle function is not automatic. Delayed/poor function of the transverse abdominis and multifidus still occurs once symptoms of back pain have settled and patients have returned to normal activity levels. This lack of local muscle control seems to be one of the reasons for the high rate of recurrence of low back pain. Core muscle strengthening is all about getting the deepest layers of muscles in the trunk (the ones that have the best mechanical advantage) to contract and stabilize the spine, whenever you are doing movements that put stress on your back. People who are inactive or have back pain will have poor strength and control in their core muscles. They will also tend to use muscles that are not suited to stabilizing the spine, which can also be a cause of ongoing pain and muscle tightness and stiffness. 1. 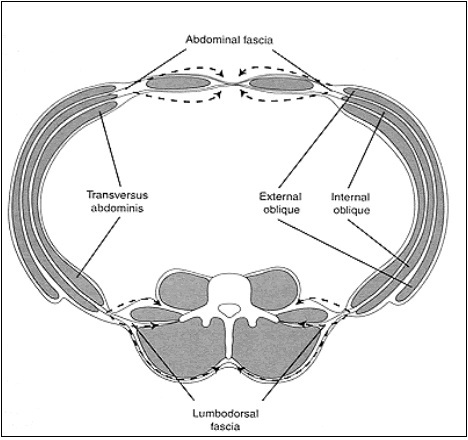 The Transverse Abdominis (TA). This is the deepest layer of your abdominal muscles and when it contracts it pulls your belly button in towards your spine. Think of it like your body’s natural corset, or even better, like a weightlifters belt that stabilizes the trunk. Research has shown that in people with healthy backs – this muscle turns on first before ANY other muscle when you move so that it can safely stabilise your spine. The transverse abdominis works together with the multifidus. 2. Multifidus is more like a little group of muscles that run from one vertebra in your lower back to the next. They are small and close to the spine and when they contract they work to stabilize each spinal segment. When you are working your transverse abdominis you will be working with multifidus as well. Retraining the deep muscular corset begins by getting a patient to activate the core muscles one by one, usually starting with the transverse abdominis. This can be far more challenging than activating a muscle such as the biceps – as the patient will often find it difficult to visualise the deep muscles, and there is no noticeable movement of the body involved. Although exercises begin in static supine positions, the deep muscular corset muscles needs to be retrained in all positions and movements including sitting, standing, driving, walking, running and golfing as examples. It is MOST important to activate these muscles several times throughout the day. Eventually, this conscious contraction will become an automatic response for the patients body. This automatic contraction will then stabilize or anchor your spine in all movements, and protect your spine from re-injury. Place your left index finger and middle finger in the soft tissue space equidistant between the left iliac crest and the lowest rib on the left side. From that position move your fingers 1 inch to medially. Do the same on your right side. To activate your core muscles (TA) either: a) draw your belly button into your spine, b) pretend you are trying to stop yourself from doing a wee (using pelvic floor muscles) or c) try to turn on your lower abdominal muscles. You should feel tension under your fingers (like tightening the sheets) but your fingers should not be pushed upwards, as this means you are using the more superficial muscles (external and internal oblique). KNEE DROP OUTS – Lie flat on your back with your knees bent and your feet flat on the floor. Breathe in. As you breathe out, activate TA using above cues and let one knee drop out to the side with control. Breathe in and bring the knee back to the centre. Repeat with the other knee. Repeat 10 times. STRAIGHTENING YOUR LEG – Lie flat on your back with your knees bent and your feet flat on the floor. Breathe in. As you breathe out, activate TA using above cues and let one knee straighten out with control. Breathe in and bend the knee back up so that your foot is again flat on the floor. Repeat with the other knee. Repeat 10 times. RAISING YOUR ARM OVER YOUR HEAD – Lie flat on your back with your knees bent and your feet flat on the floor. Breathe in. As you breathe out, activate TA using above cues and raise your arm over your head (you may use a weight or can in your hand) in a controlled manner. Breathe in and bring your arm back to your side. Repeat with the other arm. Repeat 10 times. Using the core muscle activation learnt above, these exercise are then progressed toward, sitting, standing and work or sport specific activities. Instructing patients on how to use their core muscles can be difficult at the best of times. Often it is not possible to tell if the patient is using the correct transverse abdominis and multifidus muscles, or if they are also incorrectly bracing with the internal, external obliques and rectus abdominus. Research has shown that real time ultrasound is a valid and reliable tool for imaging muscle activation of the transverse abdominis, multifidus and pelvic floor. Some physiotherapists have now started to use real time ultrasound in the clinic to check that patients are correctly activating the core muscles, and also assist the patients in understanding which muscles should be working and which muscles should be relaxed. The physiotherapist will first instruct the patient how to activate the muscles without the real time ultrasound using standard cues. After a practice the physiotherapist then images the muscles and checks for correct muscle action while demonstrating this to the patient. This technique helps enhance patient understanding of these difficult exercises and ensures that exercises are performed correctly from the very beginning. In healthy subjects, the core muscles activate before any trunk or limb movements to protect the spine. In patients with back pain core muscle activation is significantly delayed. Ultrasound is a reliable and valid tool that is useful in helping patients re-train their core muscles. Active Lifestyle Physiotherapy now has real time ultrasound available in the physiotherapy practice by appointment for the purpose of core muscle rehabilitation.